Could an underground metal band possibly influence Indonesian politics? Last week’s news of the rejection of the pleas for clemency for two Australians, Andrew Chan and Myuran Sukumaran, facing execution by firing squad is a sobering reminder that reform in Indonesia is still very much a work in progress. While President Joko Widodo’s efforts to cut through the red tape and create a system with greater accountability are rightly lauded, it is proving difficult to fix every aspect the country’s checkered past. Chan and Sukumaran’s case has caught the attention of everyone from Australian Prime Minister Tony Abbott to Amnesty International, which has started an online petition calling on the Indonesian president to stop the executions. Whether or not Widodo will pay any attention to foreign politicians or an Internet petition in this case remains to be seen, though it is unlikely given that five foreigners were executed for smuggling drugs just this month. Now, a new voice has been added to the calls for clemency for the Australian pair: British grindcore band Napalm Death released an appeal addressed to the Indonesian president himself. That a foreign grindcore band is throwing their opinion into the ring in and of itself is not particularly remarkable – the heavy metal subgenre has its fair share of politically minded bands with lyrics frequently addressing social issues. And when it comes to socially aware grindcore bands, Napalm Death, considered the progenitors of the abrasive genre, are almost certainly the best known. The group has lent their support to everything from LGBT rights to veganism. But why was Billboard discussing Indonesian politics with a British grindcore band? 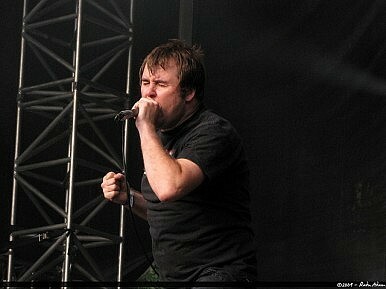 And what makes Napalm Death think anyone in Indonesia even cares about their opinion? Widodo’s renown as a reformer has drawn significant support for him both domestically and internationally, although his staunch support for the death penalty is certainly attracting critics. While numerous metal fans the world over were ecstatic about Widodo’s win in the presidential election, it’s hard to imagine many are pleased with his continued support for such draconian punishment. Obviously, it is extremely unlikely that the president of Southeast Asia’s largest economy –the tenth largest in the world in terms of purchasing power, according to the World Bank – will pay any heed to even a beloved band. But supporters of the two prisoners, who argue that they have reformed during their ten years in prison, will be hoping that Widodo’s passion for music will influence his passion for reform. Preston From is a Tokyo-based editor.